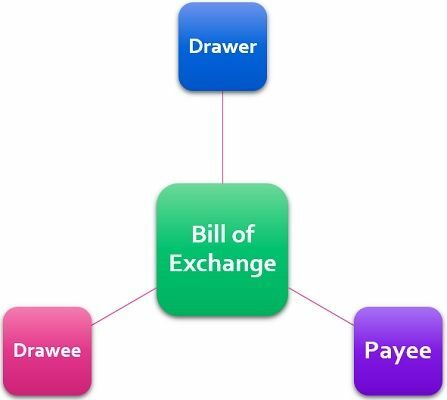 Definition: Bill of Exchange, can be understood as a written negotiable instrument, that carries an unconditional order to pay a specified sum of money to a designated person or the holder of the instrument, as directed in the instrument by the maker. The bill of exchange is either payable on demand, or after a specified term. In a business transaction, when the goods are sold on credit to the buyer, the seller can make the bill and send it to the buyer for acceptance, which contains the details such as name and address of the seller and buyer, amount of bill, maturity date, signature, and so forth. An instrument which a creditor draws upon his debtor. It carries an absolute order to pay a specified sum. It requires to be stamped, duly signed by the maker and accepted by the drawee. It contains the date by which the sum should be paid to the creditor. Payee: The person receiving payment is called the payee, who can be a designated person or the drawer himself. Drawee, in case of need: If in any bill of exchange, a person’s name is mentioned in addition to the original drawee, who can be resorted for payment. Then, that person will be called as drawee. Holder: The holder of the bill of exchange, is the person who possesses the bill and who has the right to recover the amount from the parties. Acceptor: The person who accepts the bill is called acceptor. Usually, a debtor or drawee is the acceptor. However, it can be accepted by some other person also, on behalf of the debtor/drawee. Endorser: If the holder of the bill, endorses it to another person, then the person will be called as the endorser. Endorsee: The person to whom the bill of exchange is endorsed, is called as an endorsee. Joseph gives a loan of Rs.1,00,000 to Alex, which Alex has to return after three months. Further, Joseph has bought certain goods from Peter, on credit for Rs. 1,00,000. Now, Joseph can create a document directing Alex, to pay Rs. 1,00,000 to Peter, after three months. The instrument will be called as Bill of Exchange, which is transferred to Peter, on whom the payment is due, for the goods purchased from him. Thanks very useful for me.